Several weeks back, maybe even a couple of months, I tried the meatless lunch project on Faith. The verdict was she didn't even notice. I tried again today. I could pretend that it's Lent, so no meat on Fridays and aren't I organized, but yeah, right! ;o) It just worked out that way, I would have just as easily had a meatless Monday if that was the day I happened to do it. 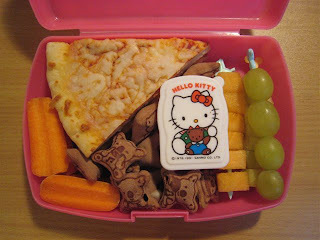 Anyhow, the girl had two small slices of cheese pizza, carrot sticks, koala cookies, some vanilla yogurt (HK container) and three fruit kebabs (one canteloup, one grape and one honeydew if you look really closely!). And once again, she did not notice the lack of meat. I'm hosting Wholesome Lunchbox event again and would love to see your entry.